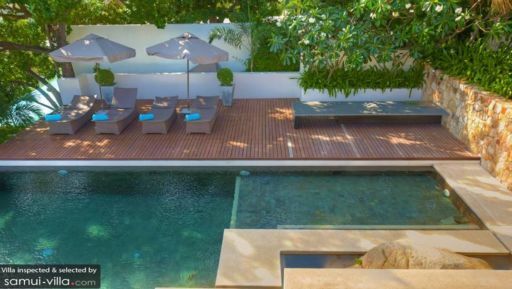 Hugging close to the coastline of Choeng Mon, Villa Sip See sits within the exclusive villa estate of Samujana. Step into the estate compound, and you will find a fine selection of modern and stylish vacation abodes in a peaceful environment. The villas overlook the sweeping bay, offering guests with spectacular vistas of the sparkling sea. Five commodious bedrooms are situated within Villa Sip See. A private terrace or garden extends out from all of the bedrooms, offering couples with a secluded spot to enjoy a quiet evening together. The master bedroom is ideal for accommodating families, for the adjoining lounge in the room can be converted into a bedroom for young children. Garden lovers will find it hard to resist the charms of Villa Sip See’s picturesque grounds. A work of art, the beautifully landscaped garden offers a vast expanse of greenery, pretty tropical blooms and an array of comfy day beds. It will be a shame not to bask outdoors in this scenic garden, for it serves as the perfect spot for sun lounging, picnics and enjoying glasses of icy cocktails. Fitness enthusiasts will enjoy playing rounds of football games in the sprawling grounds of the garden. A neutral colour scheme, minimalist furnishing and tasteful decorations lend Villa Sip See a chic, modern vibe. The open plan design of the living areas creates a sense of space, and allows plenty of breeze and natural light to stream in. Guests lounging comfortably on the couches in the living area, or feasting on a fine meal in the dining area are rewarded with stunning vistas of the enchanting garden and the azure seas. Villa Sip See is a full service property with two on-site staff. Housekeeping services, personal guest services, security services, welcome drinks, airport transfers and a daily breakfast service are included with your stay. Amenities available at additional cost include boat rental, vehicle rental, bicycle rental, personal driver services, personal chef services, laundry service and in-villa massages. The villa provides child-friendly amenities. A baby cot is available for use free of charge, while professional childminders are available at additional cost. 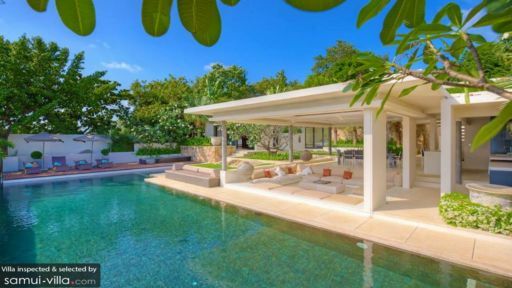 Villa Sip See is the perfect vacation rental for the active and adventurous. Villa travellers will be spoilt for choice, for there is much to see and do. Holidaymakers with a love for getting wet and wild may embark on a water ski, diving or snorkeling trip. Nature lovers and cultural buffs will enjoy venturing out to explore tumbling waterfalls, ancient temples and lush nature parks. Sailing and yachting enthusiasts can take their pick from a fleet of sailing boats or motorboats, and spend a day out in the sun cruising through the turquoise waters. At the end of a fun-filled day, spoil yourself with a soothing massage in the private compounds of your villa. we stayed in villa 14 and then for a few days in villa 18. both are ultra modern and chic with awesome views over the sea and coastline. 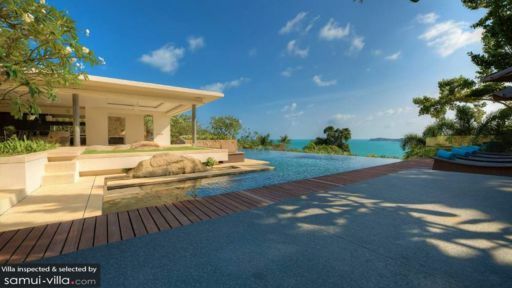 the architect has created a very clever resort where all the villas seem to be on their own and you can't see others. they all seem to have infinity pools of various shapes and sizes. Bedrooms and bathrooms are very spacious and the showers both indoor and outdoor are very cool. The staff were amazing and couldn't be more helpful. there seems to be a villa manager for each villa and then a cook/helper. Breakfasts on the terrace with stunning views are a must. You can then order 'room service' of a variety of dishes during the day. There is no real reason to leave the villa, but if you do the beach is a very short walk and there are two lovely little restaurants to choose from. A short taxi ride takes you to any number of other quality eateries.